I always come away from a concert I like thinking that perhaps it may have been the best concert I’ve ever been witness to. After a few hours of discerning sobriety (not from alcohol but from the plateau to which I inevitably ascend while listening to good live music), I realize that that performer or group, while good in concert and certainly an experience to remember, does not belong on the “best that I’ve ever seen” mantel. Snow Patrol at The Wiltern in October was excellent but they were better a couple of years ago when they played The Hollywood Bowl. But, if you attend enough live concert events, you get a feel for what is average and enjoyable versus superior and unforgettable. 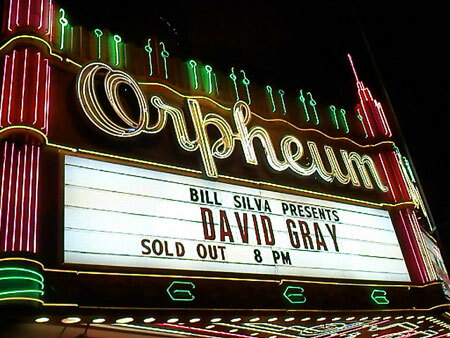 David Gray in Concert at The Orpheum Theater in Los Angeles on November 9th, therefore, can be described as one of the best all-around concerts I’ve ever seen. David Gray came on stage at about 9pm dressed in an off-gray, European straight cut suit. He was accompanied by 4 band members: guitarist/vocals, electric pianist, bassist and drummer. He appeared shy as well as driven to perform the music ahead of him – meaning there was a quick “Hello Los Angeles” and then he went right at it. There were the perfunctory “thank yous” upon the conclusion of most songs and that was it until the last song in the encore when he let loose a bit and began engaging the crowd to keep beat to the song. I believe the concert may have been recorded. The subtle communication with the crowd did not jeopardize his rapport with them. In fact, it kept them wanting. He would smile here and there, engage his band members in a smile or quick discussion. As he played, he clearly enjoyed his songs – whether he was on his acoustic guitar or trusting piano – as was often jumping or keeping an emphatic beat with his left leg. He seemed just like a perfectionist intent on delivering the best music he was capable of producing. He did. David Gray sounded like David Gray. Even his alto solos reached pitches that should only be reserved for 20-something’s. He would extend songs or deliver subtle nuances to the harmony or chord structures just so that you could tell it apart from a recorded version. He wasted no time in between songs. Listen to the sound emanating from his acoustic guitar as his fingers smoothly and quickly assume positions not even the best “Twister” player can assume. David Gray is a true master guitar player as well as singer/songwriter and to understand this you must see and hear him live in concert. The acoustics of the Colosseum at Caesars Palace is superior. The acoustics at the Hollywood Bowl are superior for an outdoor venue. The acoustics at The Orpheum in Los Angeles are just a notch below superior which means they were quite enjoyable. And considering that The Orpheum opened in 1926, one would have to rate the acoustics superb The Colosseum at Caesars Palace opened in 2003. While the upper mezzanine at The Orpheum still has the old seats of the 20’s, the orchestra has been fitted with stadium seats. I was fortunate to sit in the orchestra 10 rows from the stage. One of the first things I remember about the night when I arrived was that thsoe purchasing their tickets from DavidGray.com must have been issued the 10th row. The venue was packed, sold out. The only row with vacancies was our row. The second thing I remember is that the crowd was really into David Gray. But, it was mroe than that. They seemed to know him, to follow him, to adore him. This was not akin to the fanaticism associated with a Mick Jagger or Bono. It was deeper, more knowing and definitely more civil. 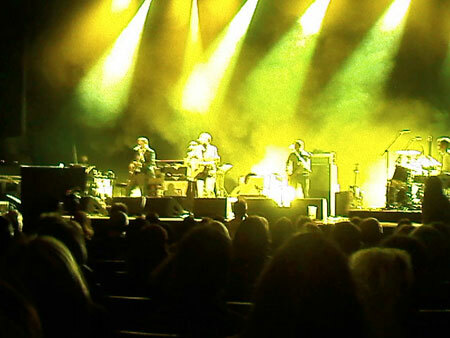 Our crowd gave David Gray 6 standing ovations throughout the night.